The Chandler Children's Choir (CCC) is a community choir dedicated to teaching the joy of singing to young people. We focus on vocal education through classic choral repertoire and offer exciting performance opportunities throughout the season. Serving youth ages 7 to 18, at CCC we know every voice in our choir, and we believe Every Voice Counts! If your child loves to sing, we invite you to learn how to become a part of CCC by visiting our Auditions page. Our three choirs are comprised of girls and boys with treble voices. We rehearse each Thursday at Desert Cross Lutheran Church located at 8600 South McClintock Drive in Tempe (map). All singers attend sight-singing classes, at no extra charge, as a part of their regular rehearsal. These classes provide our singers with the tools they need to learn to read music, solfege (do-re-mi), and other music threory skills. Season runs August through May—visit our Rehearsal Info page for details. Our progressive touring program is for all choir members. Our June summer camp is open to anyone who loves to sing. Our Prelude program is open to elementary-aged students looking for a taste of choir membership in two sessions of five to six rehearsals per season. We know every voice in our choir, and we believe Every Voice Counts! 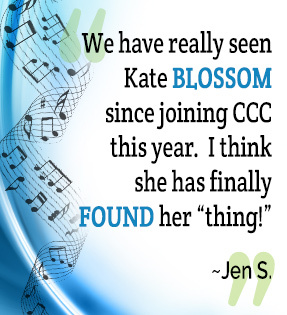 Solo opportunities abound at CCC. Local professional musicians, artists, and dancers frequently collaborate with CCC, offering a variety of cultural experiences beyond choral singing. We always conduct auditions and assessments one-on-one so directors can track each singer’s progress.